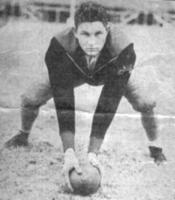 Leo Baldwin made his name as the star of the 1923 Wichita Falls team that lost to eventual state champion Abilene in the semifinals. He scored all but one of his team's touchdowns that season, and threw a TD pass to his uncle, Joe Smith, for the other score. He began his career as a tackle (and punter) but as a senior in '23 moved to fullback where he was a triple threat as a runner, passer and receiver. Fellow Hall of Famer Pete Shotwell, whose Abilene teams played against him, picked Baldwin on his all-time all-state squad. Baldwin was one of the shrine's five original members, joining Boody Johnson, Boyce Magness, Buster Mills and Blue Smith in the inaugural class of 1968. A great all-around athlete, he won seven gold medals in the hurdles, high jump and shot put at the state track meet in 1923 and 1924, setting four state records and winning the '24 team title all by himself. He also led Wichita Falls to the state semifinals in basketball and was offered a pro contract in baseball as well. He went on to become a three-sport star at Texas. Baldwin died on April 20, 1990, at age 85.